According to a dictionary definition, a leader is a person who leads or commands a group or an organization. Did you know as early as children and teenagers acquire qualities of a leader? The past few years there is an emphasis on how effective this leadership role is on a student in a school environment. However, this valuable opportunity can extend farther than just the classroom. Students in leadership roles benefit just as equally in the Taekwondo! Students involved in martial arts already have a major advantage in acquiring skills for life due to their martial arts training. But by being put into a leadership position they can bring their skill set to the next level.Students can take on leadership roles that go far beyond helping their owner track attendance or manage prospects. 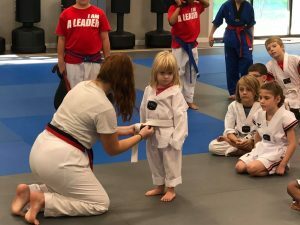 We are sharing 3 ways in which martial arts students can grow by being put into leadership roles. Often, the best way to learn and fully understand something is to be able to able to teach it to someone else. This type of hands-on experience is what instills skills in a way nothing else can. Martial arts students are already learning so many things, but when an older and more advanced student is able to demonstrate a move to the class or even be an assistant to their Taekwondo teacher, they not only set an example for other students, but acquire many skills for themselves.This is a perfect example of leadership. The benefits of martial arts goes far beyond the skills members learn on the mat and the value gained far outweighs the cost of tuition. Membership payments are an investment in their future. Martial arts are extremely helpful in preparing students for real world issues and bettering them in confidence, ability, and knowledge. By placing these students into leadership opportunities, they gain the ability to go even farther. Leadership roles in the martial arts can include a wide array of jobs and duties. From being an assistant to your Taekwondo instructor to organizing a charity event through your taekwondo school, the possibilities are endless. These responsibilities teach career-necessary skills, spur confidence and maturity, and increase communication skills. Being a leader is the ultimate way a student can grow and thrive in everything they do.